Through wonderful donations land was able to be purchased in Kenya at the end of 2007. Although, not in Europe, the intention is the same - to reach out to the kids in that country. The site is near Kimana which is close to the Tanzanian border, not too far from Mount Kiliminjaro, of which there are lovely views. Development has progressed gradually over recent years and the camp now has facilities to accommodate 16 - 24 campers in static tents with adjoining bathrooms. There is also a meeting room and basketball court, and a newly built dining room. Some of the rocks in the way were so big Bob stated "these must still be connected to Kilimanjaro!" Much effort was required to remove them. Above, we have a photo of Bob giving us a strong man pose on top of one of them. 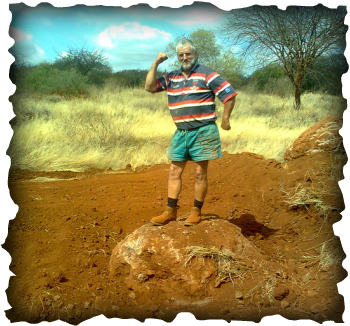 In a recent trip to Teen Ranch Kenya, Bob hired a big digger, cleared a huge stretch of land, and flattened out a football pitch for the campers to play on. The next stage of development is to continue adding tents/bathrooms until there is enough for 40 campers to be accommodated.